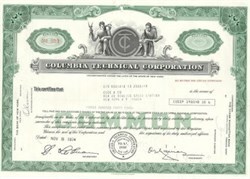 Beautifully engraved Stock certificate from the Columbia Technical Corporation dated 1969-1975. This 24 year old canceled document has an nice ornate green border around it with a vignette of two allegorical men, one with lightning bolts in his hand and the other with a protractor. The company's logo CTC is in the center. The company was involved with making Insulation Coatings, Mica Components, and Leads for Microelectronic Circuits.